… I’ve never depotted before. Which is basically the beauty blogger equivalent of a whore admitting that she’s never actually done it before. Not that I’m calling beauty bloggers whores. Well, it was Saturday night and I had about 20 minutes before I was supposed to be in bed, which obviously made it the ideal time to get out a bunch of eyeshadows, light a candle and kiss goodbye to a perfectly good cuticle pusher. 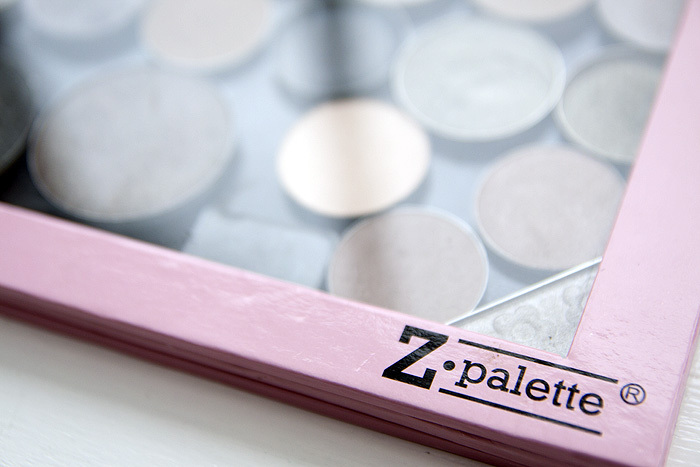 So the above Z-Palette is now made up of a mixture of depots and pressed pigments. I didn’t sacrifice any of my expensive shadows in the making of this… the whole exercise is an attempt to make me use more of the shades that I’ve been neglecting. There’s a right old hotch-potch in there – you may recognise some MUA, Art Deco, MAC, The Body Shop, Mary Quant, Maybelline, and NYX. The ones with bumpy texture are my pressed pigments (mostly The She Space, Shiro Cosmetics and Victorian Disco). All in all, it didn’t go too badly. I gouged a couple (and quickly re-pressed), dented the pans on more than a couple (what’s a few dinks between friends?) and shattered one (didn’t like it much anyway). Am I game to do the same for my more cherished eyeshadows? Am I naff. Do you depot? Always or just sometimes? I used to de-pot all the time when I was younger, but it’s not something I’ve done in ages… maybe because a lot of my shadows are powder rather than pressed. Might be a good plan to get some of the less-used ones into rotation though! I’ve never been able to bring myself to depot – I know it’s a lot neater and makes all your shadows more accessible but it’s just not “neat” enough for me! I’d have to get one of the proper palettes with the perfectly sized pans and organise them by brand and it would just be too much time, money and hassle! Depotting seems SUCH a mission. I am far too lazy for all that. Plus, I don’t think the massive OCDer in me could handle all the pans being different sizes and not beautifully aligned. Good job for doing it though, I hope it means these shadows all finally get the love they deserve! I’ve depotted most of mine, and I love it. I planned to put all of the shadows in big palettes, and have little smaller magnetic holders to put my chosen shades in for carrying around each day. 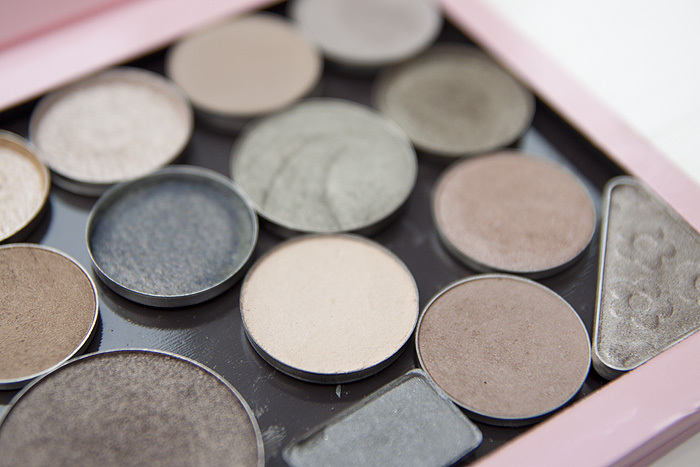 However, I ended up with all my most-loved shades in one very thin, medium-sized homemade magnetic palette, and the whole thing is so easy to cart around that I just take the whole lot with me most of the time. It’s great because I don’t have to decide what I am wearing before I get on the bus. Yeah, I do my makeup on the bus. So sue me. I have an unused Uni palette lying around coz of my laziness. Am a big clutz too..last time I ruined a perfectly good bedspread trying to depot my M.A.C eyeshadows. I wanted to do this with sleek blushes, but no one has done it before? I don’t want to screw it up! Best analogy ever? Why yes, yes I think so. That is one delicious looking palette of coolish neutralsish there! I’m far to clumsy to depot. I just don’t see the attraction of this as a pastime. 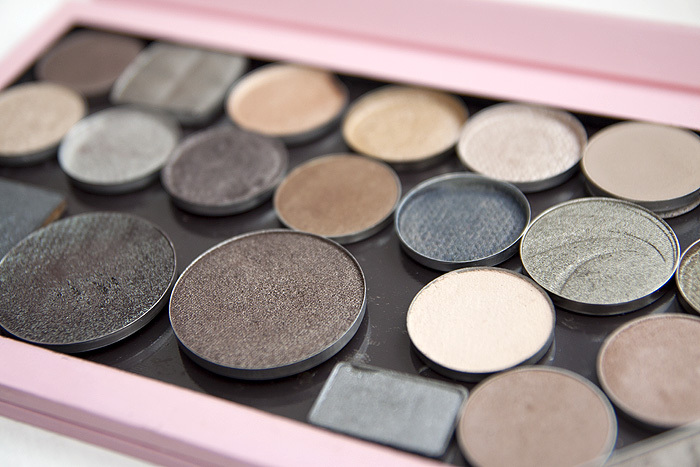 If you’re travelling, it’s far easier to sling a few singles in a bag than pack a whopping great palette. You lose any sense of aesthetic pleasure from the packaging design and the end result is often asymmetrical and untidy looking. And I get quite bothered about how in palettes different colours get used at different rates. 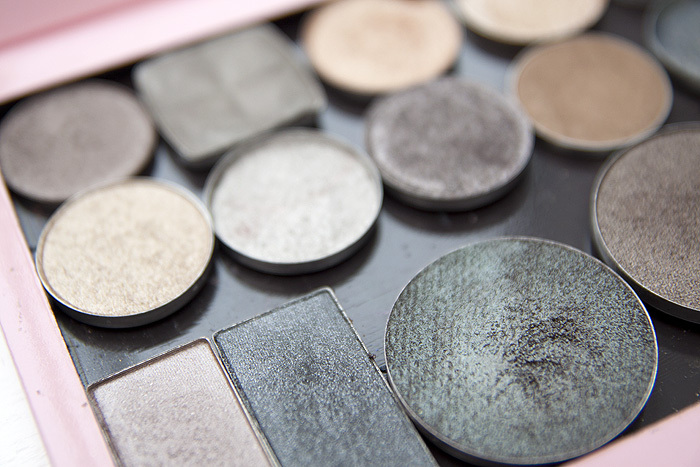 Ooooooooooooohhhhh…have you ever done a tut on pressing pigments? I have a burgeoning collection of indie make up, most of which is scattered on my dressing table, thanks to being a klutz. Oooh yeah, can you please do a tutorial on pressing pigments and the products you used/where you got them? I’d like to be able to press mine so that I actually use them. omg… I must go depot right now. I’ve probably only depotted twice in my beauty blogging life, it’s so much effort that I can rarely be bothered to do it 😛 the results are SO worth it though! I was able to recycle a ridiculous amount of plastic last time. I need to depot my shadows. I will miss the original packaging, and how tidy they were, but my eyeshadows just aren’t getting enough love! If they were in palettes, it would be so much easier to find the colors I’m looking for. 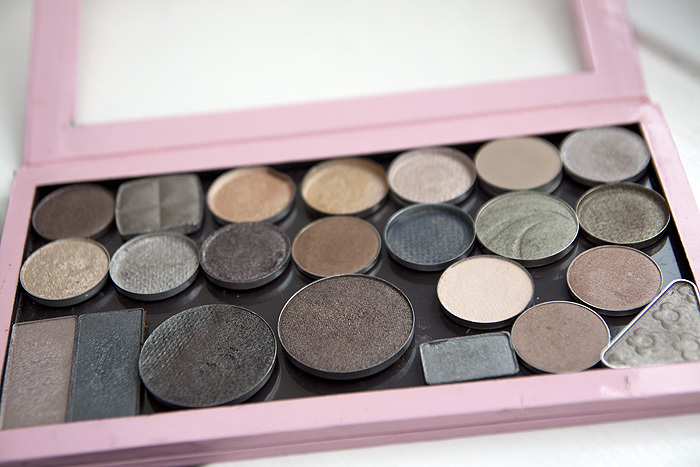 I’m planning on depotting a lot of my mac shadows into a unii pallet soon. It’s purely for the sake of space saving. And I also have some others in cardboard packaging that I’m quite looking forward to ripping apart and depotting. I have depotted a lot of my eyeshadows and put them in homemade palettes. I used some miscellaneous tins that I picked up for cheap at an Swedish auction site called Tradera. I painted and decorated the tins, put in magnetic sheets and voila, great looking palettes. Some even has mirrors in the lid. Easy to take with me when i travel and easy to store at home. I haven’t pressed my pigments yet, but I probably should to make them easier to travel with. I seriously need to get around to depotting! I’m not going to be depotting everything, but I do want to do it with some of my larger more bulky palettes like the Urban Decay Book of Shadows and my Tarte True Blood palette. As pretty as they are, the packaging is very bulky and not very space efficient. I think a z palette would definitely help me clear out some more room in my bathroom cabinets. The only time I depot is when the packaging is a cluster@#$k. As in, it no longer latches or is way too dang large for the amount of product. Otherwise, I agree with toyboys….it takes away from my enjoyment of the product to have everything smushed together in one place. That being said, when you get a lot of things like this on your hands, the Z Palette is the best thing ever.